Last week we talked about Amonkhet cards pushing older commanders to the forefront of builders’ minds and how cards we thought had settled might be shaken up again by the new activity. Sometimes one or two new cards are enough to get people excited about an old deck and people who didn’t have a deck before or are rebuilding it can be just as powerful financially as a new deck materializing. Was Anointed Procession combined with Harsh Mentor and Canyon Slough enough of an impetus for Queen Marchesa and Alesha to jump? It seems that way. Would one new card be enough of an impetus for an older deck to go up. What if it wasn’t from the latest Conspiracy set but from even farther back? Would one card be enough to get people excited about Brago? It depends. What if that card is Ancestral Recall with 0 mana buyback? With Brago, King Eternal, we take this $0.60 uncommon from an OK card in Limited if you get enough cartouches to Power 9, letting you draw 3 cards a turn if you play your cards right. 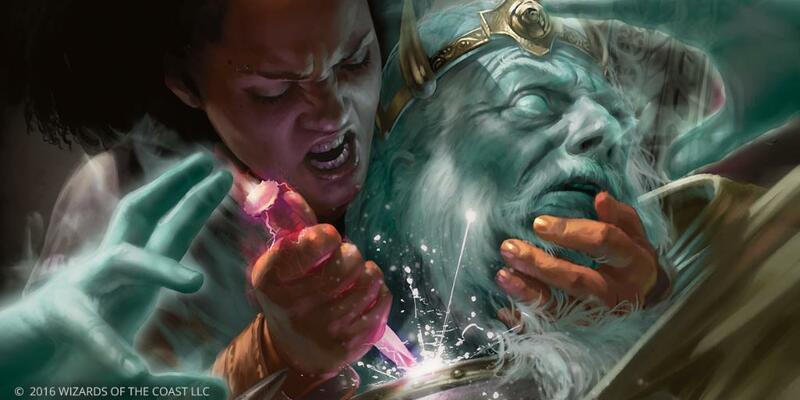 Brago was good before, was considered Tier 1 or 1.5 in French by many people (which is such a foreign concept to most EDH players that it’s barely worth mentioning) and with people starting to play 1v1 online, he could get even more popular, which could translate into paper demand. Did I say could? I mean “almost has to” because anything that is sufficiently popular will translate into being more popular anywhere no matter how much compartmentalization there is between MODO and paper and 1v1 and multiplayer. People who lose to something will imitate it. If Brago does get a second look, cards in the Brago deck, especially ones that get better with new Amonkhet cards and are therefore even more likely to make the cut in a new deck, are worth looking at. Here’s what I think matters. I think it’s basically time on this card. It’s recovering from a historic low and while I don’t like to “grab a falling knife” as they say on Wall Street, I don’t want to wait too long to see how high this bounces. I think this is one of the EDHiest cards to ever ED any Hs and that’s good for this card. 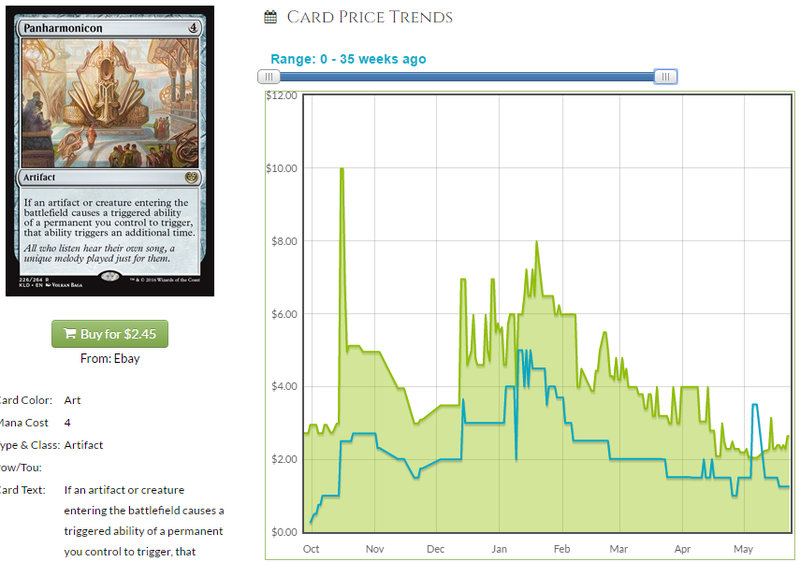 It made a bit of a splash in Standard for a minute, hence the high price. High price for a minute up first was good because a high buylist meant a lot of them went from packs to dealers’ hands as players traded them in to the LGS for store credit to buy more packs and such. Bulk rares have a tendency to accumulate and get forgotten in boxes but $8 cards are more easily accounted for. There is some danger surrounding this card vis-a-vis whether or not this eats it at rotation. If you pay $2 and this becomes $0.50, that might feel bad. But even in that situation I think you are OK paying $2 and here’s why. I don’t think this gets that cheap. This is a card used in a ton of EDH decks already and that number will only grow. Players love triggers and doubling triggers is the best. Look at what EDH has made expensive that used to be a bulk rare – Parallel Lives, Doubling Season, Mana Reflection, Caged Sun. Double is good and Panharmonicon doubles stuff. I don’t think you care even if it does tank. 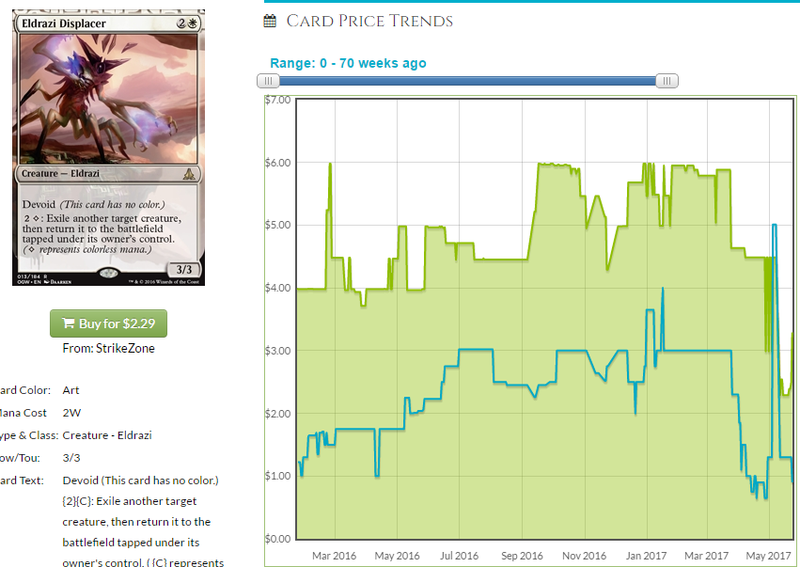 EDH demand is robust and while it’s not quite a staple, 6200 inclusions and counting is strong and that means the card will go back up. People used to say Parallel Lives wouldn’t hit $2 because it wasn’t half as good as Doubling Season. K. This card is stupid, it’s played in as many decks as Illusionists’ Bracers and that card is $2.50 and counting. If this does dip below a buck at rotation, which I doubt, buy more. Your average cost sinks way below $2 and you profit a ton when this hits $5+. I think it’s time to buy this card and worry about a potential price decrease later. They change the rotation policy every year so I have no idea what effect this rotation will have on the price of a card like this but I know that it’s about as cheap as it’s going to get for now. If you’re that worried, trade all of your new stuff that you’re sure is going to go down at rotation for these and that way you don’t worry about overpaying for cash. In general, I like to find targets that will retain value and trade all of my standard stuff that I can’t sell into them. If you find yourself waiting too long, you can also ship a bunch of standard jank in to dealers with a high trade-in bonus and cash out. Finally, there’s PucaTrade, which I guess people hate now but which has been useful for trading stacks of jank into Torpor Orbs for me. I haven’t messed with that site in a minute, though. Price correction is due here for certain. I noticed that this was $5.50 on Card Kingdom and is all but sold out elsewhere. A few shops have this at $4 or so (up from the $3 it was last time I wrote about it) but have low stock. 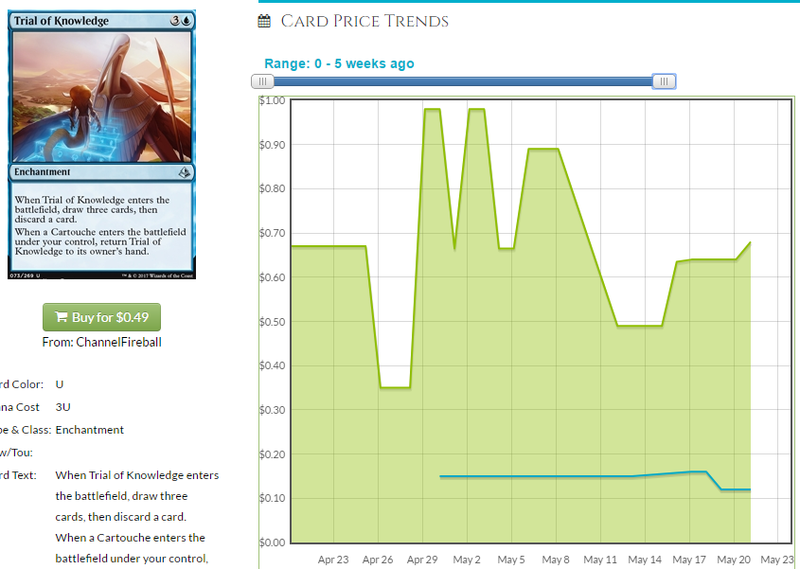 TCG Player Market Price concurs with this at around $5.50. 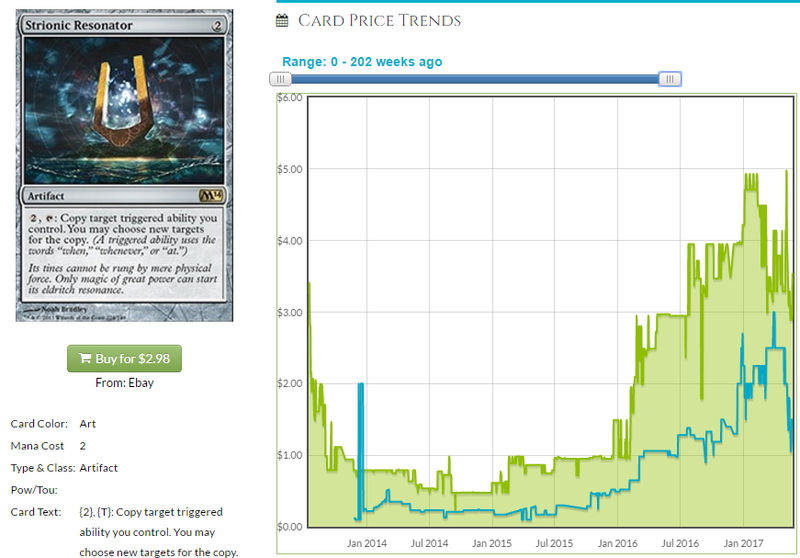 We have a coming price correction that needs an impetus, and I think more Brago decks could be it. There isn’t enough of a discrepancy between the new price ($6+) that will be coming and the current, low-hanging fruit price on a few loose copies for there to be an arbitrage opportunities, but I still think buying ahead of an impending correction is wise. This card is played in Atraxa and the number of Atraxa decks keeps growing, not to mention the number of Brago decks that are being built this week. I like this card a ton moving forward. While we’re talking about cards that I don’t think will dip a ton at rotation and which get played enough in EDH to justify paying around $2 for them, there’s this gem. True colorless mana is a little tricky to come by but shouldn’t be too arduous in a 2-color deck. You have Temple of the False God (a card I hate), Ash Barrens, Academy Ruins, Inventor’s Fair, Mystic Gate, Rogue’s Passage and Reliquary Tower all commonly played in Brago decks, though, so you should be good for an activation or two even without your Sol Ring. Again, I’m not worried about too much of a dip at rotation. I think this is played enough in enough different decks and formats that you’re not going to ever eat it buying in around $2. If this does end up $0.50 by some crazy fluke, don’t you want every copy of it at $0.50? Steel of the Godhead is $2, I’m OK paying $0.50 for Eldrazi Displacer, a card that, by the way, is way harder to reprint than Steel of the Godhead. Anyone else notice this happening? If you thought these were still cheap, well, they ain’t. They’ve been climbing for a year and while it took two years for it to finally happen, it did. I hope you snatched an armload of these for bulk back in the day. I even had Noah Bradley sign one for me. Something else to notice is that this peaked around $5 and is down a bit. This means $5 is a safe bet for a future price and as more copies get taken out of the marketplace, it’s even safer. Every dollar you buy below $5 is basically a dollar you’re guaranteed to make in a year or maybe less. Brago decks love this card and so do a lot of other decks, so I think this is a pretty safe pickup the closer you can buy to $3 right now. 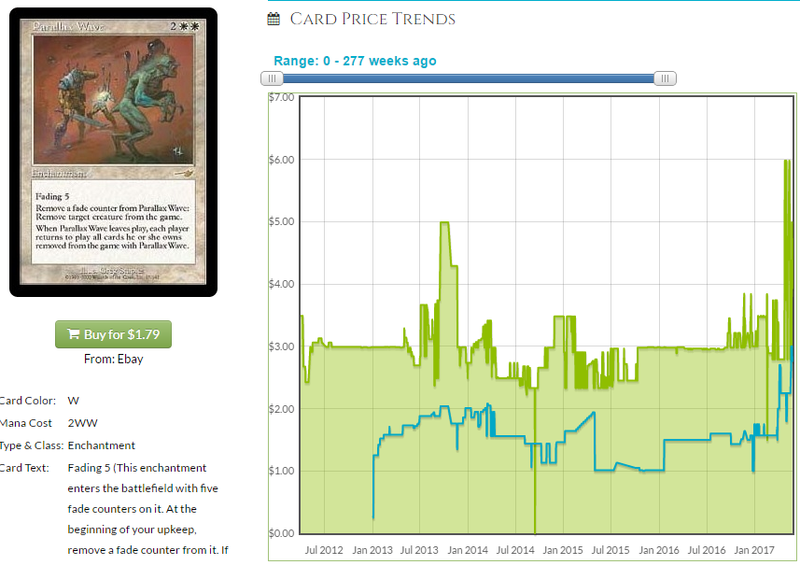 This card is 2014’s Panharmonicon and look at it grow. Everything else in Brago is either cheap or Grim Monolith. You can probably scoop up a bunch of Mystic Remora but who knows when that will pay off? (I bought a hundred of them for a nickel each but I’ve been waiting for a long time and still no payoff. At this point I might just buylist them for $0.30) You could try and make money on Restoration Angel or one of the myriad angels in the deck. You could buy every Reality Acid on TCG Player and watch everyone wonder why. The point is, if you notice something that wasn’t really exciting (Brago decks) because suddenly very exciting, see why people are excited. In this case, they’re excited about drawing 3 cards a turn on top of the cards you’ll draw with Cloudblazer and Mulldrifter. Thanks for reading. Next week, I’m sure there will be something else I notice, if only as a result of building more stupid EDH decks even though I already have too many. Until next time! Why do you hate Temple of the False God? Ever get it in your opening hand? I have been stuck on 3 lands and Temple enough to know this card is the definition of a “trap card”.